It is easy to point to all of the differences between Venezuela and the US. And to cite them as reasons why the death spiral of the bolivar could never happen here. But history is littered with once-dominant world powers that were felled, at least in part, by fiat currency dilution. Not one of them stood the test of time. The US is just another in a very long line to fall into the honey trap of fiat currency and its dilution. It is so effective for politicians while it works. It just always fails in the end. Venezuelans can no longer afford the most basic necessities. During the first quarter of 2018, consumer prices rose again, this time by 454 percent. 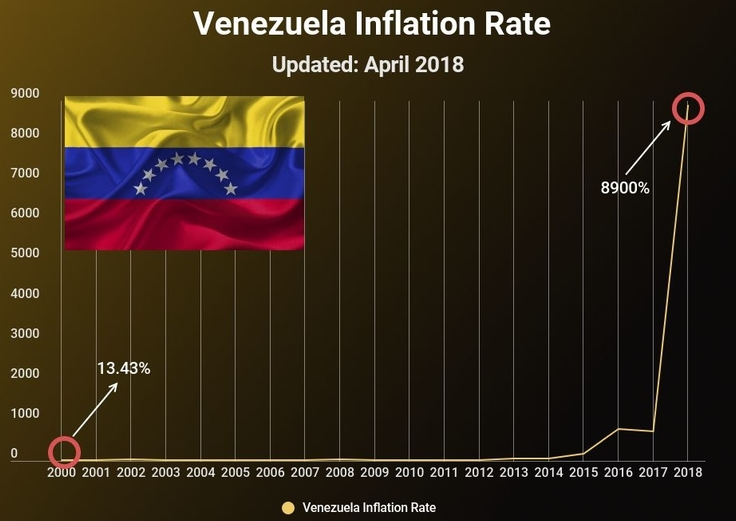 Hyperinflation has made the bolivar essentially worthless. The country experienced 8,900 percent inflation in just 12 months. According to Francisco Monaldi, director of the Center for Energy and the Environment at IESA in Venezuela, a major political change is needed in Venezuela to reverse its current devasting economic crisis. Its people are being starved by the tenets of socialism. Many Venezuelans would agree. In desperate need of food and medical care, 77 percent of Venezuelans want to see changes, and a reelection of President Maduro is not looking good. The only faction currently on his side is the military, which is using blunt force to keep the people in line. While most global economies are growing, even if only slightly, Venezuela’s economy is expected to tumble by 15 percent by the end of the year. Its GDP is expected to decline by 50 percent since 2013. Venezuela is hanging on by a thread, and the thread is fraying. Venezuela has depended on oil for 90 percent of its exports. But corruption and lack of investors have left oil industry in a state of chaos and the economy in shambles. Many Venezuelans are looking for relief abroad as they flee the country in hopes of something better. The majority of households have a family member who has emigrated abroad. Many of these are young and eager workers whose only chance lies beyond Venezuela’s own borders.